Vertu Shocks Us Again - Launches Rs 2.3 Cr Worth Vertu Signature Cobra Feature Phone! Vertu Shocks Us Again – Launches Rs 2.3 Cr Worth Vertu Signature Cobra Feature Phone! Vertu, the British manufacturer of luxury, hand-made phones has again shocked us with their launch. Christened as Vertu Signature Cobra, this is Vertu’s newest launched mobile phones, which costs Rs 2.3 crore or roughly $360,000 a piece. But, what is the big deal if it is a feature phone? It has got exotic stones which will bedazzle the spectator, and force him to hide his own smartphone. The primary and main highlight of this super-expensive phone is the beautiful snake wrapped around its frame as if protecting it. The snake has around 439 rubies and the Snake’s eye is made of emeralds, which costs around Rs 2-3 lakh per Karat, of the highest quality. There are around 388 components of this phone, which have been assembled by hand in the UK. And Vertu has made only 8 units of this phone. As per the listing information, customers can pay only $145 to book this luxurious phone, and once confirmed, the phone shall be delivered via helicopter when the full payment has been made. Last year, we had reported another outrageously expensive Vertu phone, which was priced at Rs 2 lakh a piece. Vertu’s phones, in the past, have been described as ‘tasteless trash’ by leading magazines, and have been criticised for creating something which has no importance, but very high cost. You can check out our video on the feature phone on our Youtube Channel TrakinTech. If you like the video, make sure you subscribe to us! 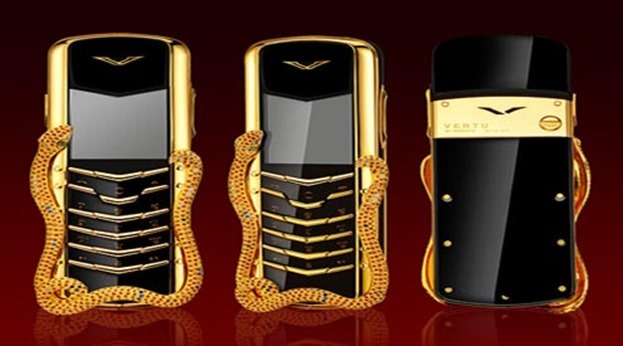 "Vertu Shocks Us Again - Launches Rs 2.3 Cr Worth Vertu Signature Cobra Feature Phone! ", 5 out of 5 based on 4 ratings. Netflix Reveals How Viewers Are Consuming Content– Indians Binge Watch Dramas During Daily Commute, Comedies In The Morning!